Featured on the World's Largest Things T-Shirt! Although born elsewhere, I grew up in the Ozarks of Missouri. I remember riding in the back (BACK back, not just back seat) of our green AMC Gremlin, looking out the window at switchbacks, gravel, and every once and a while a landmark that would make an impression on an otherwise inattentive toddler. 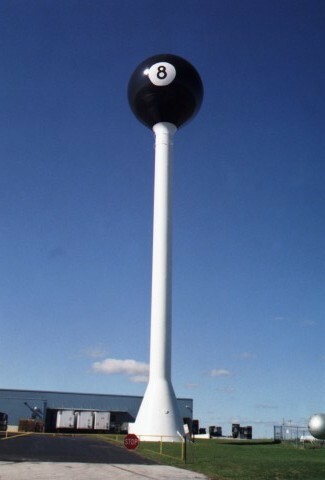 One of those landmarks was the World’s Largest 8 Ball. I had no idea what town it was until much later, mostly because the 8 ball was painted over before it was my turn to drive. Tipton Missouri was home to a Billiard manufacturer. As an ad for the business, they painted the water tower that serviced the warehouse as a giant 8 ball. When the industry moved on, the water tower was painted over. After a period of 20 years, the townspeople decided they really wanted their landmark back, so in 1999 the water tower was re-painted, re-establishing a World’s Largest Thing. Fischer Manufacturing Company was started in Tipton in 1949 by Ewald L. Fischer. He built his first crude table in his basement with the help of two assistants, an electric drill, a bench saw and other hand tools. As the years passed the table design improved and the company kept growing. Seeing his success, other towns offered Fischer a free plant if he would move to their communities. But Ewald Fischer said no. "I was born here," he said, "I'm a Tipton boy and all my friends are here." Companies attempting to buy his business never gave up. It was not until December 1968 that Fischer Manufacturing, the country's largest builder of pool tables at that time, was sold to Spalding Company, a division of Questor. In 1976 Questor sold Fischer Manufacturing to the Ebonite Billiard Co. That sale brought to a close a business which had flourished during the years Ewald was the owner. Will post more as I find more.